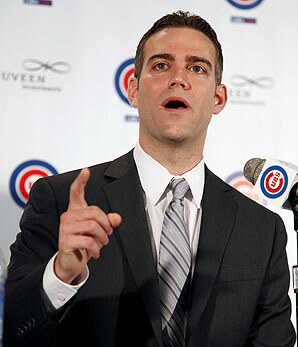 Chicago Cubs President of Baseball Operations Theo Epstein addressed the media on Friday, but, since I was doing the “play” part of all-work-and-no-play-make-Brett-a-dull-boy this weekend, I thought it best saved for today. On the terrible on-field results this year at the big league level: “No one wants to be associated with a 100-loss team. We’re going to try to win every game but if we can win enough to avoid 100, it would be a very, very small victory but certainly better than losing 100.” There’s a small, cynical part of me that wonders whether Theo really thinks that. As in, if the choice was 100 losses and the number 2 pick in 2013, or 99 losses and the 5th pick, I’m not entirely sure Theo would choose the latter (I’m not sure I would either). Relatedly, on Dale Sveum’s performance: “We told Dale in the interview, we told him that based on where we are as a franchise, we’re going to try to win, but we’re not even going to evaluate him on wins and losses in the first couple years because it wouldn’t be fair. We knew we’d be putting out a team that had too much developing talent to evaluate him strictly on wins and losses. We’ll evaluate him on a number of other criteria that we shared with him and I think he’s done a fantastic job, to be honest with you.” This is, of course, the right approach. Casting Sveum out because a young, weak roster lost a bunch of games wouldn’t make much sense. Instead, you cast him out or keep him based on the development of those young players, the attitude they show, the fundamentals the team displays, the in-game decision making he shows, and perhaps the defensive improvement of the team as a whole. On those bases, Sveum is looking at least satisfactory in my book. On the ever-present “plan” for the future: “Obviously, we really care about our fans and want them to have the best experience. But we try to be transparent about it. We have a plan and a vision, and it’s not going to happen overnight. Given the way of things, I think this is the best way to go. We’re not trying to hide the ball. We’re being honest with [the fans]. There might be another Trade Deadline in our future where we trade away 40 percent of our rotation. You do that because there’s going to be a day when you acquire two starting pitchers at the deadline to cement your club and go on a run. Our goal from the beginning is we’re going to do what we need to do to put ourselves in a position to be a contending team year in and year out and that means no shortcuts and taking the long approach. When you acquire young players and trade for prospects, it’s pretty obvious it’s not a quick road. 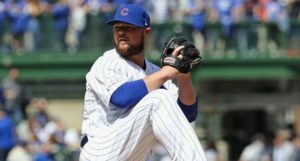 I think it’ll be a rewarding journey.” There are no lines to be read between there: Epstein is saying, plainly, that the Cubs do not expect to be competitive in 2013. They do not expect to pursue big-time free agents (or expensive veterans via trade) this offseason. The nice thing about this front office is that they are willing to be flexible on “the plan” if the market dictates they should be (if those big-time free agents or veteran trade pieces became somehow undervalued, for example, maybe the Cubs change course). But, again, plainly: that is not “the plan.” The plan is to pick up some value free agents, and other rebound candidates, and to unload as many short-term assets for long-term assets as possible, while drafting well in 2013. On no-seriously-the-plan-is-a-rebuild: “Obviously, I’ve noticed [the White Sox in contention, and the presumed competition for Chicago fans’ eyes and dollars]. There’s a choice. You can say we’re going to Band-Aid this thing and try to polish it up the best we can and make it as presentable as possible to try to squeeze every last fan through the gates this year and we’ll deal with next year next year. Or we can say we want to make this thing right, no matter how tough the road is. We’re taking the second path, so it doesn’t matter how many teams are in the city, we’re going to take the path we feel is right.” As long as the Ricketts family has the intestinal fortitude to see this thing through, I’m on board for the pain. It seems like Theo is pretty explicitly saying the Ricketts family does have the gumption to absorb some hurt at the gates next year (and maybe another year still). And, here’s the thing: even if we’re just talking about the money side of winning, if the Ricketts family wants to realize the bounty that sits on the other side of a multi-year stretch of playoff appearances, short-term pain may be necessary. On the prospect part of that hoped-for future: “The lower levels had a lot of cause for excitement, especially Boise. It was a lot of fun at the end of the year to [see] you literally had a prospect at every position, which is really rare. That was the youngest team in the league and came within four outs of proving they were the best team. A lot of good things are happening [in the minor leagues].” Something good on which to end. Next Post Next post:Pre-Gamin’: Pirates v. Cubs (7:05 CT) – Lineups, Broadcast Info, etc. Brett Taylor is the Editor and Lead Writer at Bleacher Nation, and you can find him on Twitter at @BleacherNation and @Brett_A_Taylor. 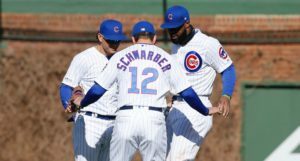 Chicago Cubs Lineup: Should There Have Been More Righties in Today? What’s Happening on The Twitters? In addition to news, Bleacher Nation publishes both rumor and opinion, as well as information reported by other sources. Information on Bleacher Nation may contain errors or inaccuracies, though we try to avoid them. Links to content and the quotation of material from other news sources are not the responsibility of Bleacher Nation. 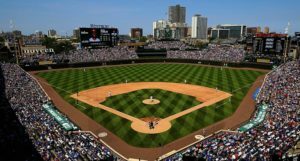 Photos used are the property of Bleacher Nation, are used under a license with Getty Images, are used with permission, are fair use, or are believed to be in the public domain. Legitimate requests to remove copyrighted photos not in the public domain will be honored promptly. Comments by third parties are neither sponsored or endorsed by Bleacher Nation.